Nabih Tahan's experience in working and living in the USA, Austria and Ireland has exposed him to the housing industry in all three countries. As a licensed architect for 28 years, Nabih has been in a position to practice, learn, evaluate and compare "how we do things" in different parts of the world. Through this experience, Nabih feels that we can all improve our systems so that we can reach our global goals of protecting our local environment and planet. To implement residential design and manufacturing construction methods practiced in Europe which result in significant reductions in energy consumption, higher levels of comfort and improved indoor air quality. 1992 Project architect at Interactive Resources, Inc., Point Richmond, California. Forensic, diagnostic and remedial architecture services, including investigating and repairing defective buildings. Consultant in construction litigation cases and first hand knowledge in analyzing inherent causes in design and construction in California and how these problems affect the health and safety of inhabitants. Managed staff of 12 architects, designers, draftsmen. 2001 Architect and developer of a 28 unit condominium complex in small village in Austria. Experience in European design and construction of low-energy homes with high levels of performance. Buildings were fabricated in components in a modern factory and shipped to site and erected by trained crews. 2005 Managing Director for Austrian home building company exporting homes to Ireland. Consultant to Irish developers and manufacturers importing energy efficient homes from Austria. 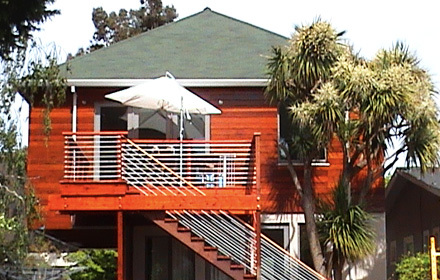 2009 Designed, built and was the first person in the United States who has retrofitted a home with the goal of meeting the Passive House standard. Speaking engagements describing modern design and construction techniques taking place in Europe where buildings are built without conventional heating systems. Nabih Tahan established BauTechnologies in partnership with Weir / Andrewson Associates, Inc., a firm which has been providing architectural and engineering services to the public and private sectors for the past fifteen years. Through this collaborative effort, BauTechnologies is in a better position to assist the building industry in reaching the goals of reducing the amount of energy our buildings consume, while improving comfort and indoor air quality. Weir / Andrewson Associates, Inc.
Weir / Andrewson Associates, inc. have architectural licenses in California, Arizona, Colorado, Hawaii, Idaho, Nevada and Washington. They also have professional and / or structural engineering licenses in California, Missouri, Nevada, Oregon and Washington. Home Energy Magazine, Nov/Dec 2008 issue - "First US Retrofit to Passive House Standard"
Retrofit Homes for a Changing Climate: Passive House in the U.S., Chapter 8, "A Passive House Retrofit"
The New York Times, December 27, 2008, "No Furnaces but Heat Aplenty in Innovative 'Passive Houses'"
Daily Californian, Dec 4, 2008, "Home Appliances Help to Heat Local 'Passive House'"
ABC 7 NEWS San Francisco, November 30, 2008, "House makes warmth without furnace"
Radio interview, kwmr West Marin, Post Carbon program, October 27, 2008 "Passive Houses with Nabih Tahan"